Not to be confused with Shakila. This article is about the singer. For her self-titled album, see Shakira (album). For other uses, see Shakira (disambiguation). Shakira performing on stage in Toronto, Canada in 2018 for her El Dorado World Tour. Shakira Isabel Mebarak Ripoll (/ʃəˈkɪərə/, Spanish: [ʃaˈkiɾa]; born 2 February 1977) is a Colombian singer, songwriter, dancer, businesswoman, and philanthropist. Born and raised in Barranquilla, her first studio albums, Magia and Peligro, failed to attain commercial success in the 1990s; however, she rose to prominence in Latin America with her major-label debut, Pies Descalzos (1996), and her fourth album, Dónde Est��n los Ladrones? (1998). According to Billboard, she has sold over 10 million albums in Latin America alone by 2001. Shakira entered the English-language market with her fifth album, Laundry Service in 2001. Its lead single, "Whenever, Wherever", became one of the most successful singles of 2002. Her success was solidified with her sixth and seventh albums Fijación Oral, Volumen Uno and Oral Fixation, Volume Two (2005), the latter of which spawned the best selling single of the 2000s, "Hips Don't Lie". [needs update] Shakira's eighth and ninth albums, She Wolf (2009) and Sale el Sol (2010), received critical praise. Her official song for the 2010 FIFA World Cup, "Waka Waka (This Time for Africa)", which featured a South African band Freshly Grounds, became the biggest-selling World Cup song of all time with 10 million downloads. With over 2 billion views, it is one of the most viewed music videos on YouTube. She has four of the twenty top-selling hits of the 2000s, more than any other artist. Shakira has received numerous awards, including 3 Grammy Awards, 13 Latin Grammy Awards, 5 MTV Video Music Awards, 7 Billboard Music Awards, 39 Billboard Latin Music Awards and has been Golden Globe-nominated. She has a star on the Hollywood Walk of Fame and sold over 75 million records worldwide, making her one of the world's best-selling music artists. From 2012 to 2015, she was listed among world's top 100 most powerful women in the world by Forbes. In 2017, she was listed as one of the world's greatest leaders by Fortune, ranked at 27th. She is a goodwill ambassador for UNICEF. Born on 2 February 1977 in Barranquilla, Colombia, she is the only child of William Mebarak Chadid and Nidia Ripoll Torrado. Her paternal grandparents emigrated from Lebanon to New York City, where her father was born. Her father then emigrated to Colombia at age 5. The name Shakira is Arabic (شَاكِرَة‎ šākirah [ˈʃaːkira]) for "grateful", the feminine form of the name Shakir (شَاكِر‎ šākir). From her mother, she has Spanish (Catalan and Castilian) and Italian ancestry. She was raised Catholic and attended Catholic schools. She has eight older half-siblings from her father's previous marriage. Shakira spent much of her youth in Barranquilla, a city located on the northern Caribbean coast of Colombia, and wrote her first poem, titled "La Rosa De Cristal/The Crystal Rose", when she was only four years old. As she was growing up, she was fascinated watching her father writing stories on a typewriter, and asked for one as a Christmas gift. She got that typewriter at the age of seven, and has continued writing poetry since then. These poems eventually evolved into songs. When Shakira was two years old, an older half-brother was killed in a motorcycle accident; six years later, at the age of eight, Shakira wrote her first song, titled "Tus gafas oscuras/Your dark glasses", which was inspired by her father, who for years wore dark glasses to hide his grief. Shakira's debut album, Magia, was recorded with Sony Music Colombia in 1990 when she was only 13 years old. The songs are a collection made by her since she was eight, mixed pop-rock ballads and disco uptempo songs with electronic accompaniment; however, it was hampered by a lack of cohesion in both its recording and the production. The album was released in June 1991 and featured "Magia" and three other singles. Though it fared well on Colombian radio and gave the young Shakira much exposure, the album did not fare well commercially, as only 1,200 copies were sold worldwide. After the poor performance of Magia, Shakira's label urged her to return to the studio to release a follow-up record. Though she was little known outside of her native Colombia at the time, Shakira was invited to perform at Chile's Viña del Mar International Song Festival in February 1993. The festival gave aspiring Latin American singers a chance to perform their songs, and the winner was then chosen by a panel of judges. Shakira performed the ballad "Eres" ("You Are") and won the trophy for third place. One of the judges who voted for her to win was the then 20-year-old Ricky Martin, whose initial prominence had come from his membership in Menudo. Shakira returned to recording music under Sony Music along with Columbia Records in 1995 with Luis F. Ochoa, using musical influences from a number of countries and an Alanis Morissette-oriented persona which affected two of her next albums. [not in citation given] These recordings spawned her third studio album, and her major-label debut, titled Pies Descalzos. Recording for the album began in February 1995, after the success of her single "¿Dónde Estás Corazón?" Sony gave Shakira $100,000 to produce the album since they predicted that the album would not sell past 100,000 copies. The album, Pies Descalzos, was released in February 1996. It only managed to reach number one-hundred-eighty on the U.S. Billboard 200 but reached number five on the U.S. Billboard Top Latin Albums chart. The album spawned six hit singles, "Estoy Aquí", which reached number two on the U.S. Latin chart, "¿Dónde Estás Corazón?" which reached number five on the U.S. Latin chart, "Pies Descalzos, Sueños Blancos" which reached number 11 on the U.S. Latin chart, "Un Poco de Amor" which reached number six on the U.S. Latin chart, "Antología" which reached number 15 on the U.S. Latin chart, and "Se quiere, Se Mata" which reached number eight on the U.S. Latin chart. In August 1996, RIAA certified the album platinum status. Shakira also received her first Grammy Award nomination in 1999 for Best Latin Rock/Alternative Album. Shakira's first live album, MTV Unplugged, was recorded in New York City on 12 August 1999. Highly acclaimed by American critics, it is rated as one of her best-ever live performances. The live album earned the Grammy Award for Best Latin Pop Album in 2001 and gained sales of five million worldwide. In March 2000, Shakira embarked on her Tour Anfibio, a two-month tour of Latin America and the United States. In August 2000, she won an MTV Video Music Award in the category of People's Choice – Favorite International Artist for "Ojos Así". In September 2000, Shakira performed "Ojos Así" at the inaugural ceremony of the Latin Grammy Awards, where she was nominated in five categories: Album of the Year and Best Pop Vocal Album for MTV Unplugged, Best Female Rock Vocal Performance for "Octavo Día", Best Female Pop Vocal Performance and Best Short Form Music Video for the video for "Ojos Así". Upon the success of Dónde Están los Ladrones? and MTV Unplugged, Shakira began working on an English crossover album. She learned English with the help of Gloria Estefan. She worked for over a year on new material for the album. "Whenever, Wherever", called "Suerte" in Spanish-speaking countries, was released as the first and lead single from her first English album and fifth studio album throughout the period between August 2001 and February 2002. The song took heavy influence from Andean music, including the charango and panpipes in its instrumentation. It became an international success by reaching number one in most countries. It was also her first success in the U.S., by reaching number six on the Hot 100. In 2003, Shakira wrote a song called "Come Down Love" with Tim Mitchell for the Hollywood movie The Italian Job starring South African actress Charlize Theron and Mark Wahlberg, but the song was not included on the soundtrack of the movie. Despite the commercial failure of the album's lead single in the U.S., it went on to spawn two more singles. "Hips Don't Lie", which featured Wyclef Jean, was released as the album's second single in February 2006. The song went on to become the highest selling single of the 21st century[needs update] and became Shakira's first number one single on the Billboard Hot 100, in addition to reaching number one in over 55 countries. Shakira and Wyclef Jean also recorded a Bamboo version of the song to serve as the closing ceremony song of the FIFA World Cup 2006. 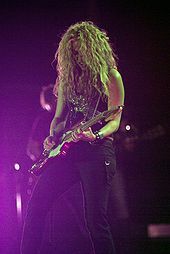 Shakira later released the third and final single from the album, "Illegal", which featured Carlos Santana, in November 2006. She then embarked on the Oral Fixation Tour, which began in June 2006. The tour consisted of 125 shows between June 2006 and July 2007 and visited six continents. In February 2007, Shakira performed for the first time at the 49th Grammy Awards and earned the nomination for Best Pop Collaboration with Vocals for "Hips Don't Lie" with Wyclef Jean. In January 2009, Shakira performed at the Lincoln Memorial "We Are One" festivities in honor of the inauguration of President Barack Obama. She performed "Higher Ground" with Stevie Wonder and Usher. She Wolf, was released in October 2009 internationally and on 23 November 2009 in the U.S. The album received mainly positive reviews from critics, and was included in AllMusic's year-end "Favorite Albums," "Favorite Latin Albums," and "Favorite Pop Albums" lists.She Wolf reached number one on the charts of Argentina, Ireland, Italy, Mexico and Switzerland. It also charted inside the top five in Spain, Germany and the United Kingdom. It debuted at number fifteen on the Billboard 200. She Wolf was certified double-platinum in Colombia and Mexico, platinum in Italy and Spain, and gold in numerous countries including France and the United Kingdom. To date the album has sold 2 million copies worldwide, becoming one of Shakira's least successful studio album to date in terms of sales. Shakira began work on her eleventh studio album in the beginning of 2016. In May 2016, she collaborated with Colombian singer Carlos Vives on the track "La Bicicleta." On 28 October 2016, Shakira released the single "Chantaje" with Colombian singer Maluma; though the song was a track from Shakira's upcoming eleventh studio album, it was not intended to be the lead single. The song became Shakira's most-viewed YouTube video, with over 2.1 billion views as of 1 June 2018. On 7 April 2017, Shakira released the song "Me Enamoré" as the second official single taken from her eleventh studio album El Dorado, which was released on 26 May 2017. Shakira also released the song "Perro Fiel" as a promotional single for the album on 25 May 2017. Its official release as the third single took place on 15 September 2017, the same date its music video, which was filmed in Barcelona on 27 July 2017, was released. Before being released as a single, was certified gold in Spain for selling over 20,000 copies on 30 August 2017. In January 2018, Shakira won her third Grammy Award for Best Latin Pop Album for her album El Dorado, making her the only female latin artist to do so. The sales for that album reached 4,000,000 copies worldwide. She celebrated this with the release of the single Trap ft. Maluma. The El Dorado World Tour was announced on 27 June 2017, through Shakira's official Twitter account, and was slated to be sponsored by Rakuten. Other announced partners of the tour were Live Nation Entertainment's Global Touring Division (which had previously collaborated with Shakira on her The Sun Comes Out World Tour) and Citi, which the press release named as, respectively, the producer and the credit card for the North American leg of the tour. As part of the tour introduction, Live Nation posted a video through its official social networks as a further reminder of it. The tour, it was announced, would begin on 8 November, in Cologne, Germany. But due to voice-strain related problems the singer experienced during her tour rehearsals, the date was cancelled one day before the original tour schedule, and it was announced that it would be rescheduled for a later date. On 9 November, for the same reason, she also announced the postponements to later dates, to be determined and announced, for both shows in Paris, as well as the following ones in Antwerp and Amsterdam. On 14 November, Shakira made an announcement, through her social networks, in which she revealed that she had suffered a haemorrhage on her right vocal cord in late October, at her last series of rehearsals, and that she thus needed to rest her voice for some time to recover; this forced the postponement of the tour's entire European itinerary to 2018. The Latin American dates were expected to be announced later, when the tour resumed. 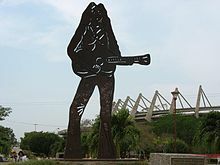 There were plans to bring the tour, when it did resume, to countries such as the Dominican Republic. In addition, a journalist from the Brazilian edition of the Portuguese newspaper Destak announced, on his Twitter account, that the Colombian singer would visit Brazil the following March. However, according to the same newspaper, due to Shakira's hiatus to recover from her vocal-cord haemorrhage, the Latin American dates were also postponed to the second half of 2018. Eventually, Shakira did recover fully from the haemorrhage she had suffered and resumed her tour, performing in Hamburg, Germany on 3 June 2018. In January 2018 she announced the finalized dates for her El Dorado World Tour. She began the first leg of her tour in Europe, starting in Hamburg, Germany on 3 June and then ending in Barcelona, Spain on 7 July. She then spent a short time in Asia on the 11@th and 13@th of July, after which she went to North America. She started her time there on 3 August in Chicago and finished in San Francisco on 7 September. In May 2018, she confirmed and announced her final tour dates for Latin America, starting off in Mexico City on 11 October@th and finished her tour in Bogota, Colombia on 3 November. Shakira has received numerous awards and recognition for her work. Shakira has sold more than 75 million records worldwide, making her one of the world's best-selling music artists. According to Yahoo!, her single "Hips Don't Lie" is the best-selling single of the last decade (2000's). [needs update] Nielsen Broadcast Data Systems said that "Hips Don't Lie" was the most-played pop song in a single week in American radio history. It was played 9,637 times in one week. Shakira became the first artist in the history of the Billboard charts to earn the coveted number one spots on both the Top 40 Mainstream and Latin Chart in the same week doing so with "Hips Don't Lie". Additionally, she is the only artist from South America to reach the number-one spot on the U.S. Billboard Hot 100, the Australian ARIA chart, and the UK Singles Chart. Her song "La Tortura" at one time held the record for Billboard's Hot Latin Tracks chart, appearing at number-one more than any other single with a total of 25 non-consecutive weeks, a record currently held by the Enrique Iglesias song "Bailando" with 41 weeks.Nokia stated in 2010, that there were more Shakira music downloads in the prior year than for any other Latino artist in the last five years, and She Wolf topped the Top 10 Latino downloads. In 2010, she was ranked number five on the 'Online Video's Most Viral Artists of 2010' with 404,118,932 views. She has become a YouTube sensation having surpassed 14 billion views on the website with "Chantaje accounting for over 2.2 billion views and "Waka Waka" accounting for over 2 billion views, and her channel is currently the 35th most subscribed on YouTube. In 2011, Shakira was honored at the Latin Grammys as 2011's Latin Recording Academy Person of the Year. She also received a star on the Hollywood Walk of Fame located at 6270 Hollywood Blvd. Originally, she was to be given a star on the Hollywood Walk of Fame in 2004, but she turned the offer down. In 2012, she received the honor of Chevalier De L'Ordre des Arts et des Lettres. In 2014, Shakira became the first musical act to perform three times at the FIFA World Cup. In the same year, Aleiodes shakirae, a new species of parasitic wasp was named after her. Shakira began her own beauty line, "S by Shakira", with parent company Puig, in 2010. Among the first perfumes it released included "S by Shakira" and "S by Shakira Eau Florale", along with lotions and body sprays. As of 2018, she has released 24 fragrances, not counting deluxe editions. In 17 September 2015, she was featured as a playable bird in the game Angry Birds POP! for a limited time, and also in a special tournament in the game Angry Birds Friends after a few weeks. In 15 October 2015, Love Rocks starring Shakira was the first video game that featured the pop star. In October 2010, Shakira expressed disagreement with French president, Nicolás Sarkozy, and his policy of expelling Romanian gypsies from the country. In the Spanish edition of the magazine GQ, she also directed a few words to Sarkozy, "We are all gypsies". In the interview she made her viewpoint very clear: “What is happening now to them (the gypsies) will happen to our children and our children’s children. We must turn to our citizens to act for the fundamental rights of human beings and condemn all that seems to us indictable”, she declared. On 2 November@th, 2018, during a visit to her birthplace, Barranquilla, for the construction of a school through her Barefoot Foundation (Pies Descalzos Foundation), Shakira spoke about the educational policies of the government under Ivan Duque (President of Colombia, 2018–2022). Speaking against the government's intentions to reduce the national education budget from 13% to 7%, she said, "This is unacceptable. It shows that instead of progressing forward we are moving backward. We need to invest more in education and we need to build more schools in places where there are none". She also talked about social inequality and unschooling. Shakira entered a relationship with the Spanish football player Gerard Piqué, centre back for FC Barcelona and the Spanish national team in 2011. Piqué, who is exactly ten years her junior, first met Shakira in the spring of 2010, when Piqué appeared in the music video for Shakira's song "Waka Waka (This Time for Africa)", the official song of the 2010 FIFA World Cup. Shakira gave birth to the couple's first son on 22 January 2013 in Barcelona, Spain, where the family had taken up residence. Shakira gave birth to their second son on 29 January 2015. 2009 Saturday Night Live Herself / Musical Guest Episode: "Gerard Butler/Shakira"
2002 Taina Herself Episode: "Abuelo Knows Best"
2005 7 vidas Herself Episode: "Todo por las pastis"
2009 Ugly Betty Herself Episode: "The Bahamas Triangle"
2010 Wizards of Waverly Place Herself Episode: "Dude Looks Like Shakira"
2014 Dreamland Herself Episode: "3"
^ "Pop Star Shakira 'Cannot Win' Bahamas Court Case". The Tribune. Retrieved 22 February 2018. ^ "Shakira Lists Waterfront Contemporary in Miami Beach". Variety. Retrieved 16 June 2018. ^ "Shakira". AllMusic. Retrieved 6 April 2019. ^ "Shakira: Singer (1977–)". The Biography Channel (FYI / A&E Networks). Archived from the original on 10 April 2013. Retrieved 28 March 2013. CS1 maint: BOT: original-url status unknown (link) Additional archive on 10 April 2013. ^ "Shakira x2 – Colombian superstar has her own ideas about crossover sucess". Billboard. Retrieved 22 March 2019. ^ a b "Shakira Introduction". Sony/ATV. Retrieved 10 August 2017. ^ Surnow, Rose. "Shakira Is a Hot Blond Genius, FML". Cosmopolitan. Retrieved 29 December 2017. ^ "Pitbull Vs. Shakira: Whose World Cup Song Is Better? (Poll)". Billboard. Retrieved 20 October 2017. ^ "Shakira Releases Sale El Sol / The Sun Comes Out Today, October 19th". Sony. Retrieved 29 April 2018. ^ "Shakira at RocNation". RocNation. Retrieved 9 December 2017. ^ Keever, Matthew (10 April 2019). "Women Who Should Be In The Rock & Roll Hall Of Fame - Shakira". Houston Press. Retrieved 10 April 2019. ^ "Most Powerful Latinas: Jennifer Lopez, Shakira And Sofia Vergara Make Forbes' List". HuffPost. HuffPost. Retrieved 28 January 2018. ^ "Beyoncé, Shakira and the World's Most Powerful Female Celebrities". Forbes. Retrieved 28 January 2018. ^ "The World's 100 Most Powerful Women". Forbes. Retrieved 28 January 2018. ^ "Top 50 World's Greatest Leader". Fortune. Retrieved 28 January 2018. ^ Diego, Ximena (2002). Shakira: Woman Full of Grace. The Rosen Publishing Group. pp. 19–20. ISBN 0-7432-1668-7. ^ Williams, Zella (2010). Shakira: Star Singer/Estrella de La Cancin. Simon & Schuster. p. 6. ISBN 978-1-4488-1066-6. ^ Day, Holly (2007). Shakira. Lucent Books. p. 15. ISBN 978-1-59018-974-0. ^ "Shakira's Catalan Blood". 2 September 2006. Retrieved 31 October 2009 – via YouTube. ^ "Shakira: dELIAs Interview". Numberonestars.com. Archived from the original on 15 May 2006. Retrieved 28 September 2014. ^ "Holy Cross: Celebrities Who Are Catholic". BET.com. 17 April 2014. ^ "Shakira". RedBalcony. Archived from the original on 13 March 2008. Retrieved 5 March 2010. ^ a b c d Wright, Evan (11 April 2002). "Cover Story: Shakira". Rolling Stone. Archived from the original on 29 April 2009. Retrieved 24 April 2007. ^ "Shakira: 'I don't hate Britney'". BBC. Retrieved 28 September 2014. ^ "Shakira Shows Jimmy Kimmel How To Be 'Incognito,' Shares Near-Death Experience With Sea Lion (VIDEOS)". HuffPost. 16 June 2013. Retrieved 21 June 2016. ^ a b "Shakira". Gale. Archived from the original on 13 February 2002. Retrieved 3 October 2012. ^ "Driven: Shakira". VH1. Archived from the original on 21 July 2006. Retrieved 24 April 2007. ^ Huey, Steve. "Shakira – Full Biography". MTV. Retrieved 20 March 2010. ^ "Donde Estas Corazon? by Shakira". SongFacts. Retrieved 20 March 2010. ^ Freedom du Lac, Josh. (31 August 2006). "In Any Language, a Whole Lotta Shakira Goin' On". The Washington Post. Retrieved 22 January 2007. ^ "Billboard – Artist Chart History: Shakira". Billboard. ^ "RIAA: Gold & Platinum. Search results for Pies Descalzos". RIAA. Archived from the original on 7 September 2014. ^ "Música- Shakira". Europanas.com. Retrieved 21 June 2016. ^ "SS Music". SS Music. Archived from the original on 15 October 2007. ^ "Pies Descalzos: Description". Shakira.com. Archived from the original on 30 March 2010. ^ "Vendrá Shakira a México a promover Nuevo disco". El Universal. Retrieved 3 October 2017. ^ "Half.com / Music / ¿Dónde Están Los Ladrones?". Product.half.ebay.com. 26 October 2009. Archived from the original on 15 December 2006. Retrieved 31 October 2009. ^ "Shakira – MTV Unplugged: Review". AllMusic. ^ "Emilio Estefan Tops Latin Grammy Noms List". BMI. Retrieved 21 June 2016. ^ Valdes-Rodriguez, Alisa. "Queen of Crossover?". Los Angeles Times. Retrieved 21 June 2016. ^ "Gloria Estefan Reveals She Taught Shakira How To Speak English For Her 2001 'Laundry Service' Album". Los Angeles Times. 5 December 2013. Retrieved 16 July 2018. ^ "Ask Billboard". Billboard. 12 May 2004. Archived from the original on 17 October 2007. Retrieved 31 October 2009. ^ Lechner, Ernesto. "Shakira: Laundry Service". Rolling Stone. Retrieved 11 May 2017. ^ Elizabeth Mendez Berry. "Shakira. Laundry Service". In: Vibe, vol. 9, No. 12, p. 188. ^ "Shakira and Enrique Iglesias join line-up for Live Earth Hamburg". PR Newswire. 22 June 2007. Retrieved 16 June 2012. ^ "Shakira's songs are the heart of her success". Bmi.com. 30 July 2007. Retrieved 12 November 2011. ^ "Shakira's Official Website. Sign up for email updates!". Shakira.com. Retrieved 10 July 2012. ^ "Артисты: Shakira". First Class Agency. Retrieved 21 July 2011. ^ "Shakira Tickets, Wembley Arena". Ticket4-you.com. Archived from the original on 3 May 2007. Retrieved 6 May 2011. ^ "Search results for Shakira". National Academy of Recording Arts and Sciences. ^ "Shakira Wins Big at Latin Grammys News". CBS News. 2 November 2006. Retrieved 2 November 2006. ^ "Oral Fixation vol. 2: Description". shakira.com. Archived from the original on 30 March 2010. ^ "Shakira named Artist of the Year". Harvard Gazette. 16 February 2011. ^ a b Winistorfer, Andrew (3 September 2009). "Shakira and Britney Dominate List of the 20 Best-Selling Singles of Last 10 Years". Prefixmag.com. Retrieved 22 October 2010. ^ "Contactmusic.com". Contactmusic.com. Retrieved 31 October 2009. ^ Bayona, Jose (7 November 2007). "Gabriel Garcia Marquez & Shakira are soundtrack pals". ShakiraMedia.com. Retrieved 8 January 2008. ^ "The Top-Earning Women in Music". Forbes. 29 January 2008. Retrieved 29 January 2008. ^ Sisario, Ben (2 July 2008). "Shakira Leaves Record Company for Live Nation". The New York Times. Retrieved 2 July 2008. 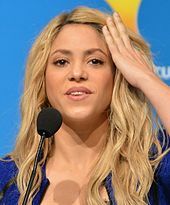 ^ "Shakira Sued for $100 Million by Ex-Manager". The Hollywood Reporter. 12 April 2013. Retrieved 12 April 2013. ^ Gallo, Phil (18 January 2009). "We Are One: The Obama Inaugural Celebration". Variety. Retrieved 8 February 2009. ^ "AllMusic's Favorite Albums of 2009". AllMusic. Rovi Corporation. 15 December 2009. Retrieved 31 December 2013. ^ "AllMusic's Favorite Latin Albums of 2009". AllMusic. Rovi Corporation. 14 December 2010. Retrieved 31 December 2013. ^ "AllMusic's Favorite Pop Albums of 2009". AllMusic. Rovi Corporation. 17 December 2010. Retrieved 31 December 2013. ^ Mackey, Robert (24 May 2010). "Shakira Remixes African Hit for World Cup – The Lede Blog". The New York Times. Retrieved 10 August 2010. ^ "Shakira scoops prestigious MTV award". FIFA. Archived from the original on 11 November 2010. Retrieved 9 November 2010. ^ "AllMusic's Favorite Albums of 2010". AllMusic. Rovi Corporation. 14 January 2011. Retrieved 31 December 2013. ^ "AllMusic's Favorite Latin Albums of 2010". AllMusic. Rovi Corporation. 20 December 2010. Retrieved 31 December 2013. ^ "Past Winners Search". Latingrammy.com. Latin Academy of Recording Arts & Sciences. Retrieved 9 January 2014. ^ a b Cobo, Leila (6 November 2010). Beyond Physical. Billboard. p. 74. Retrieved 28 August 2013. ^ Aguilar, Justino (27 September 2011). "Shakira Is Latin Grammy Person of the Year". Billboard. Retrieved 28 August 2013. ^ "Shakira reviendra à Bercy le 14 juin". Chartsinfrance (in French). Retrieved 10 January 2011. ^ "Shakira Honored as Latin Grammy Person of the Year". Billboard. 10 November 2011. Retrieved 16 November 2011. ^ "Emotivo tributo a Shakira como Persona del Año" (in Spanish). El Heraldo. 10 November 2011. Retrieved 17 October 2013. ^ Lewis, Corner (25 June 2012). "Shakira, Pitbull collaboration 'Get It Started' leaks online". Digital Spy. Retrieved 6 July 2012. ^ Ramon. "News – Shakira Signs To Roc Nation as her Management". ShakiraMedia.com. Retrieved 25 April 2012. ^ "Shakira upcoming singles 'Truth or Dare' and "Beautiful Disaster"". Ultimate Music. Retrieved 28 September 2014. ^ "Escuche 30 segundos de la nueva canción de Shakira que está grabando en Lisboa". El Heraldo Colombia (in Spanish). elheraldo.co. 30 June 2012. Retrieved 1 July 2012. ^ "Shakira y Rihanna hacen una canción – Revista Elenco". Eltiempo.Com. 4 December 2013. Retrieved 24 March 2014. ^ O'Mance, Brad (24 February 2014). "Shakira's next single is called 'Empire' and might be online quite soon". Popjustice. Retrieved 17 March 2014. ^ "Shakira – Dare (La La La) (Radio Date: 28-03-2014)". Earone. 2 February 1977. Retrieved 1 April 2014. ^ "Shakira – Dare (La La La) (Radio)". Radio Airplay-official. 2 February 1977. Archived from the original on 7 July 2014. Retrieved 1 April 2014. ^ "Musical Superstars to wow audience at FIFA World Cup™ Final". FIFA. 2 July 2014. Retrieved 14 July 2014. ^ a b Cobo, Leila (3 July 2014). "Shakira Confirmed to Perform 'La La La' at World Cup Closing Ceremony". Billboard. Retrieved 14 July 2014. ^ "Shakira New Album 2016: Singer Reveals Details About The Upcoming Eleventh Studio Album : TRENDING : Youth Health Magazine". Youthhealthmag.com. 18 February 2016. Retrieved 21 June 2016. ^ "Shakira Drops New Single 'Chantaje' Featuring Maluma: Listen". ^ "Nicky Jam, la sorpresa en el nuevo álbum de Shakira | elsalvador.com". elsalvador.com. 26 May 2017. Retrieved 15 September 2017. ^ "Shakira Premieres 'Perro Fiel' Music Video With Nicky Jam: Watch". Directlyrics. Retrieved 15 September 2017. ^ "Shakira feat. Nicky Jam – Perro Fiel". PROMUSICAE. 30 August 2017. Retrieved 31 August 2017. ^ "SHAKIRA Wins GRAMMY for Best Latin Pop Album". Shakira. Retrieved 22 February 2019. ^ a b "SHAKIRA ANNOUNCES EL DORADO WORLD TOUR, PRESENTED BY RAKUTEN". Shakira.com. 27 June 2017. Retrieved 27 June 2017. ^ "Shakira Announces EL DORADO WORLD TOUR, Presented by Rakuten". Live Nation. 27 June 2017. Retrieved 28 September 2017. ^ "MESSAGE FROM SHAKIRA RE COLOGNE SHOW / NOTA DE SHAKIRA SOBRE EL SHOW DE COLONIA". Shakira.com. 7 November 2017. Retrieved 7 November 2017. ^ Aybar, José Antonio (28 June 2017). "Shakira incluye RD en El Dorado World Tou" [Shakira adds Dominican Republic on El Dorado World Tour] (in Spanish). El Nacional. Retrieved 19 October 2017. ^ Mim, Udovitch (23 January 2002). "Q&A: Shakira – A pop artist with a rock & roll heart". Rollingstone. Archived from the original on 7 February 2009. Retrieved 27 November 2009. ^ Chadha, Monica (4 September 2006). "Shakira's hips Bollywood bound?". BBC. Retrieved 3 February 2010. ^ "Shakira proud of Arab background". BBC. 4 November 2005. Retrieved 3 February 2010. ^ "Shakira". Thecelebezine.com. 8 February 2010. Archived from the original on 27 March 2008. Retrieved 5 March 2010. ^ Lechner, Ernesto (17 October 2001). "Shakira: Laundry Service Review". Rollingstone. Archived from the original on 26 June 2009. Retrieved 27 November 2009. ^ a b Cobo, Leila (10 November 2001). Billboard. 113. Nielsen Business Media. p. 94. ISSN 0006-2510. Retrieved 10 November 2013. ^ a b Ma, Suzanne. "Cover Story: Shakira – A Cultural Fusion". Faze. Retrieved 10 November 2013. ^ Henderson, Alex. "Laundry Service – Shakira". AllMusic. Rovi Corporation. Retrieved 10 November 2013. ^ Petridis, Alexis (8 March 2002). "Thong songs". The Guardian. Retrieved 10 November 2013. ^ "Shakira: The 'She Wolf' Billboard Cover Story". Billboard. Retrieved 27 November 2009. ^ Ditzian, Eric (21 July 2009). "Shakira Says New Album She Wolf Is 'Very Electronic'". MTV. Retrieved 24 March 2014. ^ "She Wolf". Shakira.com (Archive). Archived from the original on 9 November 2012. Retrieved 28 September 2013. ^ "Shakira plans November release for 'Sale El Sol'". The Independent. London. 23 August 2010. Archived from the original on 24 September 2010. ^ "Shakira – Sale El Sol – Sony Music Entertainment Germany GmbH". Sonymusic.de. Archived from the original on 11 October 2010. Retrieved 22 October 2010. ^ "Shakira inlfuences". Inflooenz.com. Retrieved 8 July 2016. ^ "The poet and the princess". The Guardian. UK. 8 June 2002. Retrieved 8 June 2002. ^ Huey, Steve. "Shakira Biography". MTV. Retrieved 27 November 2009. ^ "Mini Biography – Shakira" (PDF). Dailynews. Archived from the original (PDF) on 10 May 2012. Retrieved 8 June 2002. ^ "Artist Influences for Shakira". MTV. Retrieved 8 July 2016. ^ Mendoza, Nadia (29 September 2009). "Shakira spills toned tum secret". The Sun. London. Archived from the original on 2 October 2009. Retrieved 12 November 2011. ^ "Shakira's Belly Dancing Discovery". contactmusic.com. 27 January 2006. Retrieved 16 July 2007. ^ "Shakira – Shakira Scores Most-Played Record". Contactmusic.com. Retrieved 31 October 2009. ^ "BBC – Music -Shakira". BBC. Retrieved 20 March 2010. ^ Mendizabal, Amaya (29 October 2014). "Enrique Iglesias' 'Bailando' Breaks Record for Longest No. 1 Run on Hot Latin Songs". Billboard. Retrieved 21 June 2016. ^ Barber (3 May 2010). "Shakira Most Downloaded Latin Artist". TMM – The Music Magazine. Archived from the original on 12 March 2012. Retrieved 3 May 2010. ^ Barber (10 December 2010). "Year-End: Online Video's Most Viral Artists of 2010". Billboard. Archived from the original on 4 October 2012. Retrieved 28 February 2011. ^ "Photos: Shakira Honored As 2011 Latin Recording Academy Person Of The Year". B96 Chicago. 10 November 2011. Archived from the original on 14 November 2011. ^ "Shakira to be honored with star on the Hollywood Walk of Fame". Shakira.com. 1 November 2011. Archived from the original on 3 February 2014. Retrieved 10 July 2012. ^ Ramon (10 November 2011). "Shakira to be honored with star on the Hollywood Walk of fame". ShakiraMedia.com. Retrieved 12 November 2011. ^ "New addition to Hollywood walk revealed". Ireland On-line. 21 June 2008. Archived from the original on 13 October 2008. Retrieved 31 October 2009. ^ "Shakira receives Ordre des Arts et des Lettres award". Shakira.com. 28 January 2012. Archived from the original on 14 November 2012. Retrieved 10 July 2012. ^ "Asteroid Freddiemercury and 12 other peculiar things named after pop stars". BBC. 7 September 2016. Retrieved 17 September 2018. ^ "El Oasis". IMDb. Retrieved 28 September 2014. ^ "The Rhythm of Shakira". Puig.com. Retrieved 28 September 2014. ^ "Shakira perfumes and colognes". ^ Shaul, Brandy (15 October 2015). "Rovio Launches Love Rocks Starring Shakira on iOS, Android | SocialTimes". Adweek. Retrieved 21 June 2016. ^ a b Kit, Borys (14 August 2015). "Shakira Joins Voice Cast of Disney Animation's 'Zootopia'". The Hollywood Reporter. Retrieved 14 August 2015. ^ "This News Don't Lie: Shakira is Coming to a Disney Movie Near You". Disney Playlist. 14 August 2015. Retrieved 15 August 2015. ^ Travers, Peter (3 March 2016). "Zootopia". Rolling Stone. Retrieved 4 March 2016. ^ Pressberg, Matt. "Anti-Racist 'Zootopia' Is Crushing It in Countries Where Diversity Often Doesn't Play". International Business Times. ^ Hipes, Patrick (8 December 2016). "AFI Awards: Best Of 2016 Film List Includes 'Silence', 'Hacksaw Ridge' & More". Deadline Hollywood. Retrieved 8 December 2016. ^ McAfee, Tierney. "People.com : Celebrity News, Celebrity Photos, Exclusives and Star Style". Teenpeople.com. Retrieved 21 June 2016. ^ "Shakira honoured by United Nations". The Belfast Telegraph. Retrieved 4 March 2010. ^ "Free Your Mind: Shakira". MTV Europe. 7 November 2010. Archived from the original on 19 July 2011. Retrieved 7 November 2010. ^ "Barça agreement with Shakira". Mundo Deportivo. 1 March 2011. Archived from the original on 3 March 2011. Retrieved 12 November 2011. ^ "Shakira Named Latin Recording Academy Person of the Year". National Academy of Recording Arts and Sciences. 26 September 2011. ^ Zaretsky, Robert; Miljanic, Olivia (6 September 2010). "Opinion | France and the Gypsies, Then and Now". The New York Times. ISSN 0362-4331. Retrieved 22 February 2019. ^ "Shakira a Sarkozy: "Todos somos gitanos"". elreferente.es. Retrieved 22 February 2019. ^ Ray, Downs (18 June 2018). "Ivan Duque Wins Colombian Presidential Race". UPI Top News. ^ Clark, Cindy (30 July 2009). "Shakira breaks out of her cage for 'She Wolf' album, video". USA Today. Retrieved 17 December 2009. ^ "France, 1/10/11". Shakira.com. 10 January 2011. Archived from the original on 2 February 2013. Retrieved 10 July 2012. ^ a b "Antonio de la Rúa, Shakira's Ex-Boyfriend, Sues Star For $250 Million". HuffPost. 6 September 2012. Retrieved 24 January 2013. ^ "Shakira Sued for $100 Million by Ex-Manager". The Hollywood Reporter. 12 April 2013. Retrieved 14 April 2013. ^ "Shakira Wins: Ex-Boyfriend's Lawsuit Dismissed, Singer "Could Not Be Happier Now"". E! News. 2 August 2013. Retrieved 10 October 2016. ^ "Gerard Piqué and Shakira spotted together again". whoateallthepies.tv. Archived from the original on 23 November 2010. Retrieved 22 November 2010. ^ "Shakira welcomes baby boy Milan Piqué Mebarak". NBC News. Retrieved 23 January 2013. ^ "Shakira welcomes second baby boy Sasha Piqué Mebarak". Shakira News. Retrieved 30 January 2015. ^ "Rolling Stone confirms new Shakira album in 2019". Rolling Stone. 28 December 2018. Retrieved 28 December 2018. "Video – VH1 – Driven Shakira (11–22–05)". ShakiraMedia.com. Retrieved 31 October 2009. "New York Music – River Deep, Freckle High – page 1". The Village Voice. 25 December 2001. Retrieved 31 October 2009. Wikimedia Commons has media related to Shakira.